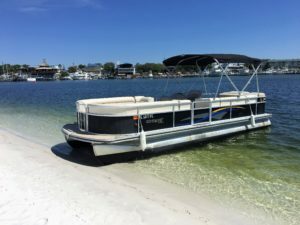 Destin Pontoon Boat Rentals- Best rates! 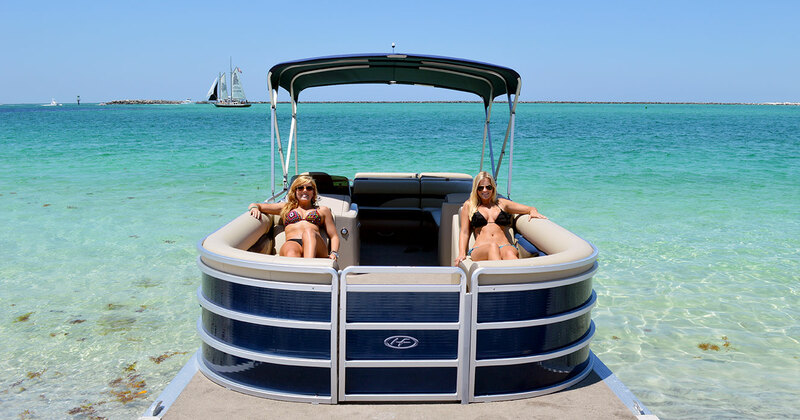 Destin Pontoon Boat Rentals Are the Best Way To Get To CRAB ISLAND! There is no better way to explore our beautiful Destin waters than to rent a pontoon boat for a day! Here at Dockside Watersports, a pontoon boat is the most popular for many reasons. The adventures are never ending when you are your own captain- your family can park on a beach and snorkel, anchor at Crab Island to swim and relax all day, cruise around the bay while Dolphin watching, take it out during our one-of-a-kind sunset or cap your Thursday night off by being right underneath the T-6 Destin Warbirds airshow followed by Fireworks (call for more information)! If fishing is more of what you are looking for, check out our Destin fishing boat rentals page. We serve Destin, Fort Walton Beach, 30A, Santa Rosa Beach, Miramar Beach, Grayton Beach, & Navarre Beach, Florida. Our Destin pontoon boat rentals are offered at different lengths to accommodate for your party size with varying engine sizes. 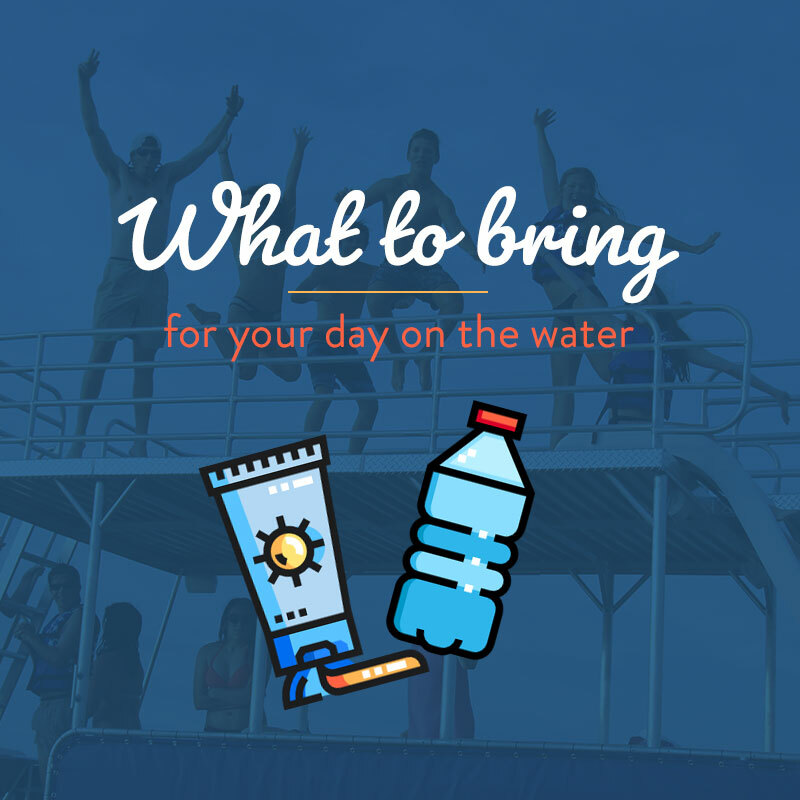 All boats are equipped with a bimini top that can be opened for shade, an anchor, all USCG certified life jackets, room for coolers, and the cleanest seating! You can rent our Destin pontoon boat rentals for 4 hours, 8 hours, or for the sunset. If you and your family are staying in or around Destin, Fort Walton Beach, 30A, Santa Rosa Beach, Miramar Beach, Grayton Beach, & Navarre Beach, Florida, imagine spending your day in Destin relaxing at Crab Island or exploring the bay in search of dolphins! You can do both! Our Destin pontoon boat rentals are offered with different size engines and lengths to accommodate for your party type. Our boats are comfortable, clean, and make it easy to navigate the Destin waterways. Want to go for a nice sunset cruise? Captain your own pontoon boat as you watch our famous Destin sunset. The possibilities are endless! Please call us at 850-428-3313 for pricing information. We can’t wait to be a part of your Destin vacation! So, come see us!